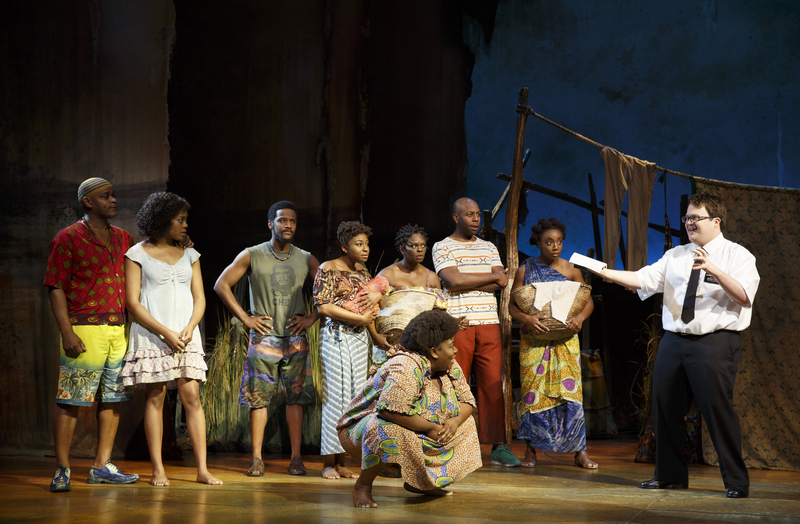 Before Hamilton shot onto the scene early last year, The Book of Mormon was the hottest ticket on Broadway. This smash musical hit won a hefty nine Tony Awards, including Best Musical…but does it live up to it’s hype? Yes, yes it does. 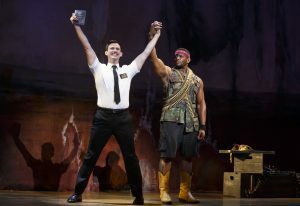 And you might actually have a decent chance to see it, since The Book of Mormon‘s national tour has returned to the Twin Cities and plays at the Orpheum Theater in downtown Minneapolis through May 29. An attempt at missionary work. Photo by Joan Marcus. Ryan Bondy appears as Elder Price (punchable golden boy and missionary extraordinaire,) paired with the terminally awkward yet exuberant Elder Cunningham, played by Cody Jamison Strand. Bondy reaches just the right mixture of smarmy self-satisfaction and disarming innocence, and Strand is, to use the medical term, completus funnius madeyuppus (“completely made of funny”). Bondy and Strand drive the action with their strong chemistry and charisma, but the beating heart of the show comes in the form of Nabulungi, a young woman who is the first to have faith in the missionaries’ stories, played by the enchanting Candace Quarrels. Ryan Bondy and David Aron Damane at the climax of “I Believe”. Photo by Joan Marcus. Filling in the rest of the roles are what may be some of the hardest working ensemble members in the business. 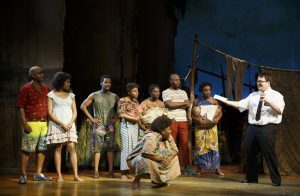 One of the underrated pleasures of the production must be the precision comedy choreography (courtesy of Casey Nicholaw), and the cast keeps the energy up and the sight gags flowing as tap-dancing missionaries, pantomime religious figures, beleaguered villagers, minions of Satan, or even Starbucks coffee cups. Nicholaw also codirected the production with Trey Parker, and their irreverent sensibility, Scott Pask’s scenic design, and Ann Roth’s costumes manage to make this coming-of-age comedy musical about religion feel textured and vibrant onstage. Stone, Parker, and Lopez have crafted a tightly plotted, well-paced, wonderfully scored, and hilarious musical, fun for the general audience member and full of winks and references for the die-hard musical fan. The Orpheum makes a great venue for this production, large enough for the broad comedy and big production numbers yet small enough to maintain an intimate and guileless atmosphere. This perfectly reflects the youthful energy and inexperience that make this show so endearing. Somehow, this profanity-laden religious satire skirts the cynicism you might expect and ends up one of the more joyous and life-affirming shows you might see in a while.